Ugh! Monday again? I think we need to start keeping track...I think Monday is squeezing itself in more than once a week...at least it feels like it...lol! Lots to chat about today! First....I have been absent the last few days in the blogging world. If you are familiar with my track record, then you know this is no cause for alarm ;) However, I do have an excuse. My computer contracted a virus...4 to be exact. The program I am using (Kaspersky Internet Security) seems to have disinfected the files and cleaned it up...knock on wood. The thing that bothers me is the only thing I can think that I did differently this week was blog hop like mad. I am not a computer whiz so I do not know if I could have picked something up this way or not. It was kind of scary because the viruses were in my D drive which houses all of my system restoration files. Never had one there before. Let's hope I never do again! Next on the list...guess what? I wish I could insert here that I won the lottery, or am getting published, am pregnant, or some other fabulous news. Sadly, my news is that I think my kidney stones are back :( I wasn't sure over the weekend, but when I woke up this morning, I can say there is no other pain to confuse it with. I am still at work and am super miserable, although I am trying to be upbeat. I am not one for complaining, but YOUCH!!!! I am flushing myself with cranberry juice and water (I hate cranberry juice) in attempts to try to avoid a trip to the doctor's or ER. I just have to pee every 5 seconds and I work by myself, so this is inconvenient and annoying...lol! I just want to lay down with some moist heat (I do not know why that makes it feel a bit better, but it does so I go with it....it is probably mental...ha ha) and take it easy. I am only working 8 hours today, so I hope the time flies by. I do have some work to finish tonight. I hope I feel up to it. The good news is that only 1 of the things I need to do is due tomorrow. 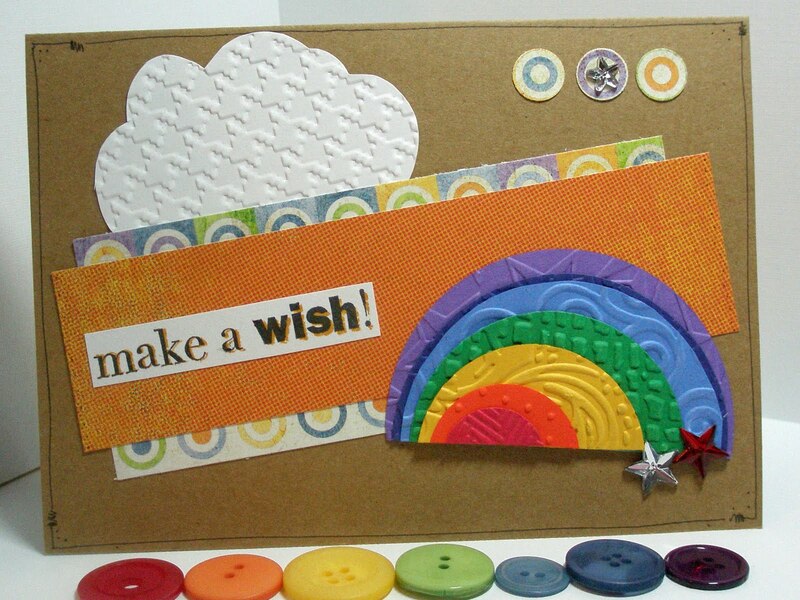 I shall leave you with a card...rainbows are always happy right? This card was made for the latest challenge at Simply Scrapping Crafts and it is based on an amazing sketch by my DT Sistah Amy. Here is a link to play along...you have to check out this sketch..it is so inspirational! Texture Folders: Regal Flourish, Burlap (Tim Holtz for Sizzix)...I may have some of the names wrong on these...I am not home to check them out. These are just half circles...once you emboss them and layer them, they really pop! That is it for today! Please do not forget to pop on over to The Rubber Cafe and vote for my sistah Maureen! Thank you all!!! Happy Monday! That is me...trying to be upbeat...lol ;) How am I doing so far? That card is just ridiculously cute!!! Hope you're feeling better, kidney stones sound terrible!! Hello Pryn! I just noticed that you are my 300th member in the PCP Pixie Dust Studio group! Please email me and let me know what image you would like as a gift! !I would like to let you pick a free digi from the STUDIO for being our 300th member!!!! I love this card!!! I so have to lift it. Hope you feel better soon.